New Delhi: Despite the arrival of season’s festivities, the Bt cotton farmers of India’s western and central agriculture belt have too little to smile about. 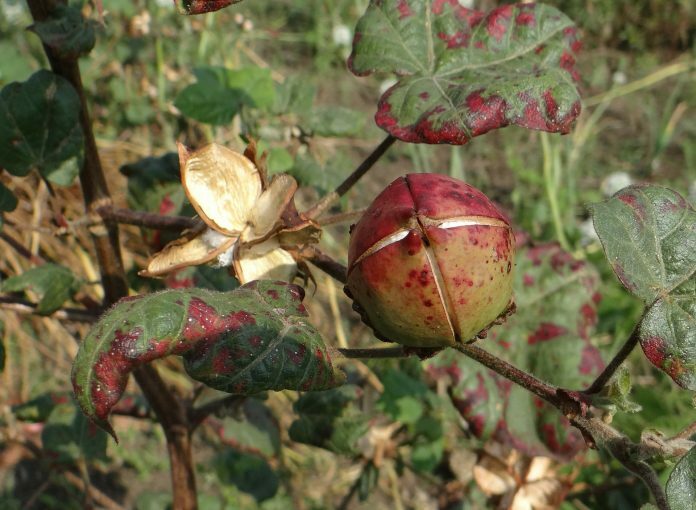 Having witnessed happier times in the past, this time the imminent threat to their crops, the pink bollworm (PBW), is giving them the sleepless nights. Old story one may say but their worries this time can no longer be brushed aside as the bollworm has now rechristened itself into a highly resistant avatar. Yet, this did not happen overnight. Over the years, pink bollworm has developed resistance to Bt cotton and during the last cotton season alone the pest has caused a crop loss ranging from 20 percent to 25 percent across the states. Some farmers even lost the entire crop as it had to be uprooted due to severe damage. This year, the loss could even go up, which could lead to major agrarian crisis, if timely checks are not implemented, experts have said. Mr S S Bainade, former professor at Marathwada Agriculture University, describes the pink bollworm problem as “quite serious” in almost all districts in the region. “The problem occurs during dry spells and when we do not receive adequate rains,” he says while pointing out that the insects have been noticed over past couple of months. Giving a hint towards the gravity of the situation, Mr Prabhakar Rao, Chairman and Managing Director, Nuziveedu Seeds points out that the damage ranges from 10 percent to 40 percent as per various sources in the current year. As per Government report damages in Gujarat ranged from 10-67 percent in 2015-16. In the absence of cotton, or as a genetically pre-disposed condition, the pink bollworm undergoes hibernation or diapause that allows it to be dormant for 6-8 months, until the next season. “Insect resistance to toxins is a signal that is dangerous to ignore. The problem can only get worse over the ensuing years, if left unattended,” he cautions. The pink bollworm is a larvae that burrows into cotton bolls to feed on the cotton seeds and in the process it destroys the cotton lint. This feeding damage allows other insects and fungi to enter the boll and cause additional damage. When the larva exits the cotton boll it leaves a perfectly round and clean cut exit hole which is diagnostic of pink bollworm damage. It was during the year 2009 when the Monsanto entomologists detected and, ultimately confirmed, pink bollworm resistance to the first-generation single-protein (Bacillus thuringiensis) Bollgard I cotton in four states in Western India. Monsanto’s first-generation single-protein Bollgard I cotton (MON531) uses a naturally occurring Bt protein (Cry1Ac) to control insect pests. While as per company, the resistance is natural and expected, the detection of pink bollworm resistance to Bollgard I posed a significant threat to the nearly 5 million farmers who were planting the product in India. Then came the Bollgard II, a second-generation cotton seed that contains two different Bt proteins which replaced Bollgard I in all of cotton seed markets. It was said to provide additional and more robust protection against the bollworm. However, the history seems to have repeated itself here as the insect is no longer afraid of the so called resistant variety. There may be slight differences in versions but the experts are unanimous in terming the threat as real and situation alarming. “Bollworms are still the most dangerous pests of cotton, as they thrive on boll or fruit of cotton which contains Kapas or fibre, thereby causing severe economic damage,” says Dr S B Patil, Professor in Department of agricultural entomology, University of Agricultural Sciences, Dharwad. Agrees the Entomologist B Rosaiah, former associate director of research at N G Ranga Agriculture University, Guntur, Andhra Pradesh, said the pest is a problem in all the cotton growing countries and in India its attack is proven to be severe in late sown cotton crop -in July and harvested in November-December. Time of sowing and harvesting play a key role? Renowned scientist and now the President of South Asia Biotechnology Centre (SABC), Dr CD Mayee, feels that the pink bollworm is becoming a serious pest to cotton in central India where the crop is taken during monsoon season and sown on the onset of monsoon. As per government statistics, cotton is grown between 10.5 million to 12.5 million hectares (or 25-30 million acres) across 11 major growing states of Maharashtra, Gujarat, Telangana, Andhra Pradesh, Karnataka, Punjab, Haryana, Madhya Pradesh, Rajasthan, Odisha and Tami Nadu. In peak years like the current period, it may touch 12 mha. The losses due to the bollworm attacks have been estimated to be up to approximately 7,000 crore. The war has to be won! Explaining the importance of IPM, Mr N M Sharma, managing director of Gujarat Cotton Cooperative Federation, says that the pupa of PBW which is a monophagous pest that feeds only on Cotton, has a tendency, where its pupa intelligently hides underground during winters and then emerge out to attack Cotton crop with vengeance. The resurgent pink bollworm has led to the expression of serious doubts over the viability and success of genetically modified cotton by the activists. At the same time, the experts have been defending its controversial introduction and subsequent monopoly as the success. In the midst of the this, the farmers are in a catch 22 situation. At the moment, the awareness about the right sowing time and integrated pest management seem to be the best solutions. Hope the agriculture ministry will constitute a high-level committee to access the damage and strengthen the ways to tackle the same.